The discovery of a 3D holographic image resembling the Buddha Form on the Moon sheds new light on the phrase "Finger pointing to the Moon". The discovery provides a strong basis to better understand Gautama Buddha's path to enlightenment and his profound wisdom in creating the Bhavachakra (Wheel of Life). A historic site where the North Vietnamese Army fought a pitched battle against the South Vietnamese Army along with US infantry. Feeding on Cafe' -- Excuse me! How did the can get into the monkey's hands! I recently advised a graduate student towards his Master's degree in electrical engineering. I had known this student for over 3 years. Very bright, ready to share his ideas, meticulous in his work, and above all very respectful to all those around. Of course, anyone who has such outwardly visible characteristics is no doubt very engaging and can carry on discussions on any topic in great detail. The student was gifted. He could describe his ideas in such great detail in a well thought out manner answering why the idea is worthy of exploration and how he would approach solving the problem. His problem-solving skills and critical thinking amazed me. He approached me and asked me to be his advisor. There are many reasons why students request change in advisors. I was aware that another professor was his advisor at the time and it was natural that I asked the student why he intended to change advisors. What I heard behooved me! I could not have imagined the interactions that led the student to totally reject the advisor. How can it be? I wondered. I had to pull myself back and think whether all the things that were said could be true. It was hard to believe that a colleague as portrayed by the student is the same individual that I know for the past few years. No way, I thought. It can't be true! But one thing I do know to be true is that the student is very bright, full of new ideas, friendly, highly diligent, very meticulous and is among the most dedicated individuals one can find at the graduate level! I asked him repeatedly why he wishes to walk away from his previous work. His response was: "I came here to obtain my Phd. I cannot relive the experience by telling you the details. I am sorry I cannot share with you everything that happened, but one thing is clear that I do not wish to work with my current advisor. I only seek something useful after four years as a graduate student that give me the necessary qualifications for my future academic aspirations. I am happy if I can obtain a Master's degree and move on". When asked why he wishes to change his advisor, the student showed me a doctor's certificate describing his frequent breakdowns both physically and mentally requiring therapeutic treatments and medication to decrease the effects of anxiety attacks. The discomfort he expressed made me feel sad as I tried hard to bear with his pain and suffering. As i listened, I felt there must be something I can do that transform the state of mind, which the student was experiencing, and to make him think positive. Knowing his capabilities, I felt certain that he had the motivation, the inspiration, and the creative ability to conceive and develop an advanced optimization technique I had been thinking about recently -- (all in light of World affairs, global threats, identifying terrorist network, ...). I needed some student to take on the challenge of addressing real-time threats in terms of optimal sensor placement knowing that threats evolve, spread and must, therefore, be tracked. Hence, the optimization required a fair knowledge of Kalman filtering, an algorithm used for control and navigation. The student was extremely knowledgeable in optimization approaches and convinced me of his commitment to achieve a targeted outcome. Cheers of joy sparkled around the student the moment I acknowledged to help him achieve his goal. He was elated, exuberant, excited, energetic and emotional about his ability to graduate with a Master's degree under my guidance and advisorship. His demeanor transformed from one who appeared to have lost his way, to one who had just found the way! He was just overjoyed! The student blew my mind away by developing an algorithm for optimal sensor placement in power systems operation and control. An area that is intimate to me, I saw the development as revolutionary. A power system is highly nonlinear and serves as a testbed to examine disturbance propagation. Naturally, sensor placement is a critical issue. The student had shown me that there could be a better way to analyze, interpret, and track terror threats. All of the above happened over a period of three months during the summer of 2017. Did I do the right thing by accepting the student's request to be his advisor? Not so, says the former advisor! An email I received from the student's former advisor said: "I just came to know that my PhD student completed a MS Thesis option with you. I was not even aware of this, since he told me he was sick and gave me a doctor's certificate that said he cannot work for an extended period of time. I am wondering if you knew I had funded him for 4 years, and if a change of advisor form was filled out. Thanks,"
My response: "I believe the student filled out a form. Department should have a copy." Former Advisor: "I think you should have asked me before consenting to take away a student I had funded for 4 years. I do see your signature on the form that says I was his advisor." My response: "There was no malicious intent on anybody's part, certainly not me, and I can vouch for the student's sincerity and forthrightness with me as well. The student was on the verge of a breakdown. When someone is at that point, it is only proper to provide the necessary moral support so the person does not fall apart! It was the student's decision to change advisors due to all the reasons, which only he knows. I accepted his request based on things which he said he can accomplish towards a Master's degree. I am happy that he recovered to pursue his dreams elsewhere! If you wish to talk in person, I will stop by your office on Monday." Former Advisor: "I don't want to get into intent; let us leave that part to our conscience. Let us talk common courtesy between colleagues and departmental policy. When a student makes a request to change advisors for whatever reasons, the previous advisor must be kept in the loop, so the other part of the story can come to light. I can't imagine this not being done by my colleague or by the department head. In light of the fact that he was perfectly able to pursue other research, I realize he simply lied to me, kept me waiting (he told me he will finish work as he recovers) and shirked work that he was supposed to do and was capable of doing. Now I am doing that work myself, because I promised it to the funding agency. When a faculty invests countless hours and substantial money on a student, he/she should be assured that the department will support him/her. With this kind of latitude given to students, a student can come in, get supported through someone's grant money, and when he is done with coursework, simply walk away with a degree. I am really struggling badly to digest what happened here. I am now afraid to hire another student." The response completely blew me away. For a few moments, I could only say Wow! I can't believe what I am reading! How could someone show their ego so vividly? Whatever happened to the compassion and empathy that one must have towards others? I felt that everything the student mentioned to me about his advisor beginning to unfold. (Sidebar) Truth exists. One must find it. After some pondering on how to respond I felt I can share a similar instance when one of my Ph.D.. students abruptly decided to quit. I could not provide the details of my discussion with the student for obvious reasons. My response: "I can easily relate to your frustrations and anguish by referring to my Ph.D. student who left after 2 years of funded support and obtained his Master's degree in Industrial Engineering. I suppose the department policy must enforce that students seeking a change of advisor must obtain the consent of his/her advisor first on the "Change of Advisor" form. This would guarantee that a discussion has taken place and the reasons for the change is acceptable and can be well-documented. I am, however, sorry I personally did not inform you. My sincere apologies." Former Advisor: "Let us forget it; you were not the only person who signed that form. I will make sure the form is changed and the procedure is enforced. Best regards". The last response from the former advisor is an example to distinguish between one's ego and the feelings of empathy towards others. When one's ego kicks in, the individual has lost the feelings of compassion towards others. The loss of a Ph.D. student due to the advisor's own lack of empathy and mindfulness must be understood. Advisors don't have ownership of students! Students have every right to choose whomever they want as Advisor to guide them through their academic goals. Advisors must self-assess why a student might consider change in advisors and accept the change without any hesitation, or hold a grudge against the student. WOW! I can't believe I had to write this. But, writing has made me learn and understand what it takes to be an advisor -- to be tolerant, mindful, compassionate, and caring. Returning to a normal daily life following a time porting travel experience is truly a euphoric feeling. As real as it was that I was with my dear family and my closest relatives and friends, it appeared dreamlike and illusionary. I did not have time to think. I felt immersed in a sea of emotions taking me as far back in time and as deep as I could have imagined within a short stay of nine days. Here is one flashback that made me feel as if I met myself when I was 9 years old. We lived in a corner home with a big yard. From my window, I could see the full profile of Chamundi Hills. During Dasara, the night would glow with a Golden hue from the Maharaja Palace and the Chamundi Temple. Next to our home there was a beautiful park. We went to the park every day. My friends from high school would visit our home every evening. As kids, we played marbles, cricket and a local game called "gilli-dhandu." We spun tops and challenged each other to compete. In the end, someone always was the winner. Often, I lost because I was not good enough and also because I was lean and not as well built like my friends. My nice shiny top would get pock-marked with stabs of defeat carved all over by the opponents. It certainly took great skill in a champion top spinner to break the opponent's top. I do recall a friend of my older brother who held the championship for spinning tops and was the best gilli-dhandu player! I could only imagine having a friendly game with him but never actually compete with him! He was just too good! I found an inspiring Youtube video of the game that brought back memories from the past. I recently had a travel experience where I felt I was travelling back in time. With no prior expectation of how I will perceive anything, I wonder now after returning back if I had in some way met myself back 60 years ago. I saw my mother, my brother and my two sisters for the first time after 12 years. I met several of my cousins and near family relatives whom I had not seen in more than 15 years, some who I have not seen in 30 years and a few I have not seen in 40 years. I met my classmate from 50 years ago. Then, finally as if this was not far enough, my childhood friend from 60 years ago made contact by phone. I have to ask myself, "Is this real?" It felt like an experience of the Bootstrap Paradox. Having had the privilege to model and study every utility in the continental U.S. power grid, there remains little doubt of terrorist intrusion in the near future that will seriously affect the Nation's infrastructure. In what could originate as a local intrusion, meaning that the SCADA system of a small utility could be hacked, it is likely that the entire power grid could be disrupted by propagating the disturbance through neighboring tie-lines. 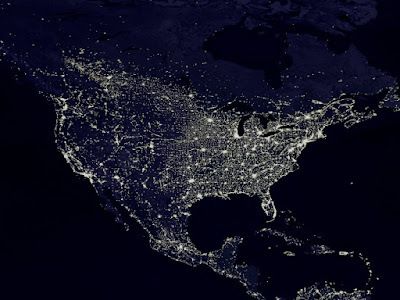 With a blackout there would be no traffic lights, automated banking systems will not work, gas stations and electric vehicle charging stations would stop service, with backup generators only a few commercial enterprises would operate at their minimum capacities, all modes of transportation will cease. Only those systems that have uninterruptible power supplies would continue to operate, but not for too long. This obviously includes critical services affecting the health and well-being of the society. It is likely that utilities could rapidly restore the system, but the impact has enormous consequences affecting the safety and security of the US. As one researcher describes, this could be done for "Fun and Profit". We could not be far away from the truth of how a terrorist perceives this as a threat on the US power grid. 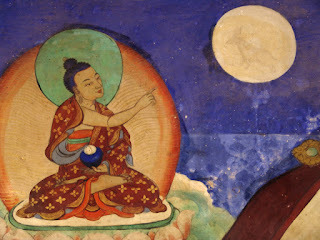 On the first Full Moon night following enlightenment, in a gesture of pointing his finger at the Moon, Gautama Buddha told his five disciples that truth is not an illusion. One must find where truth exists. An early 1st Century Tibetan wall painting is a depiction of this gesture. The historical picture appears to be part of the Bhava Chakra. The top part of the Wheel of Life (Bhava Chakra) is a depiction of Gautama Buddha pointing to the Moon. In some paintings, one can see a standing Buddha, and in some others, one can see a sitting Buddha pointing to the Moon. What could Gautama Buddha have implied with such a gesture? The most common meaning given to the gesture is to not look at the finger, but, to look where the finger is pointing. What do you see if a person points a finger at something and says "Look there and you will find your answer"? That is our question. One must wonder about it at all levels of scientific and philosophical inquiry to seek a message from the gesture and decode it for all humanity to feel and experience a sense of global awakening. From all aspects of human and biological evolution on Earth, the Moon and the Sun have for long been the center of study, by ancient theologians, philosophers, explorers and scientists . How do the Moon and Sun affect life on Earth? From a philosophical perspective, Gautama Buddha said, "There are Three things that cannot remain hidden, the Sun, the Moon, and the Truth". We know that the Moon appears and disappears with a period of 29.5 days. We know that there are ebbs and tides in the oceans on Earth. While we know many things about the Sun and the Moon, what is the Truth that remains hidden? Where? One cannot ignore what exactly the Grand Master was indeed pointing at and continue to philosophize about the gesture as it has been done until now. Philosophy is good because it teaches the moral values. Either through receiving explicit instruction or as a practitioner of education, we learn to practice what we preach. That which exists must be seen. The question one can ask is, in what form? One may not believe in a story about a fact, but, the fact still exists that Gautama Buddha pointed his finger at the Moon. 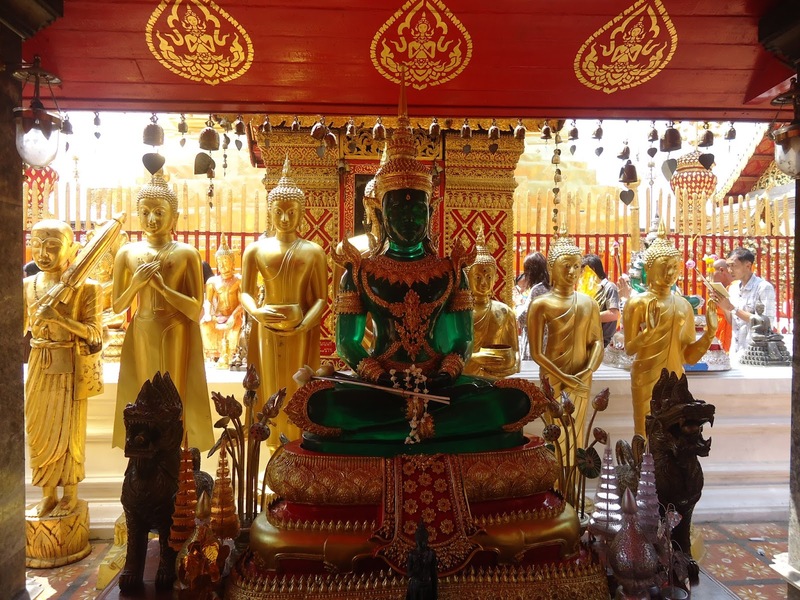 What did Gautama Buddha see that inspires us to realize the power of tour Mind? One can only assume this means the power to perceive. Naturally, this thought coincides with the notions that perception leads to thinking, thinking leads to understanding, understanding leads to greater knowledge, and greater knowledge raises the state of the conscious Mind. Truth exists in all forms. Anything we wish to know about the Universal truth exists. Where does one find it? If there is a message in this gesture, then the message must be perceived as such. But, what is the message? What did Gautama Buddha intend for all of humanity to see, understand and experience in our travel through time and space? Why now? It would be a moral obligation that if there is anything seen and known to be true, then one must reveal the truth. What does Sun-face Buddha or Moon-face Buddha mean? Philosophically, of course, there are an endless number of ways to interpret Master Baso's reply. Was it just a matter of saying that he felt angry at times and pleasant at other occasions? Or, is it likely he had seen and understood what was on the Sun and what was on the Moon to describe the feeling of his illness? What could he have meant? What was the message of his reply? Of course, only Master Baso would know that. It forces one to think things through to understand what the message indeed is. "Seeing is believing" is a common phrase that gives one the perception that nothing is believable until it is seen by the eyes. If this is true, then it is not enough just to hear about it. We must see to believe what we hear to be true. Is it true, therefore, that seeing is believing? "Vision is the art of seeing what is invisible to others," wrote Johnathan Swift (1667-1745 AD). So, "what is the art in vision? ", we could ask. To answer this, perhaps yet another phrase used to describe one's blindness brings greater understanding. The phrase "Blind as a Bat" is used to describe someone that does not have enough visibility in the eyes, poor vision and cannot see. It could also be used to say that someone is ignorant. But the question is; is it true that a Bat is blind? 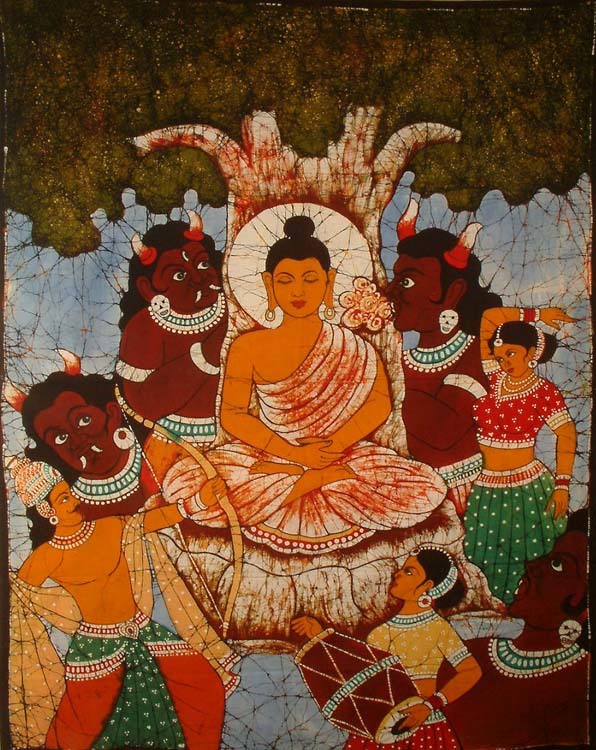 Buddha, in Sanskrit "भुद्ध ", means "the Awakened One". 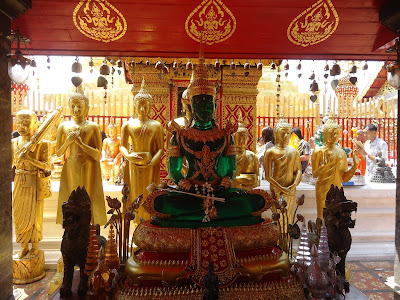 Gautama Buddha means "Gautama The Awakened One". Anyone can, therefore, feel awakened and experience an awakening. Hence the phrase "There is a Buddha in everyone", meaning "There is an awakening in everyone". We must make the effort to seek it. Our quest is Where is the Buddha? Not Who?! Not When?! Not Why?! Not What?! Just Where! Where is the Buddha? It must be inside yourself, the Inner-Self, the Inner-Mind, the Inner-Consciousness. Communication theory describes how messages are coded at the sending end, sent over a transmission medium, and decoded at the receiving end by considering propagation delays in node-to-node message passing, channel noise, and transmission bandwidth limitations. It is understandable that looking at the finger of a person pointing at something gives little or no information, i.e., low entropy, low uncertainty, mostly everything is known, and not much is unknown. However, if one were to look beyond in the direction being pointed, one is overwhelmed and deluged by too much information and not know what to see or select, i.e., high entropy, great uncertainty, no prior information, too many unknowns. "The fundamental problem of communication is that of reproducing at one point either exactly or approximately a message selected at another point. Frequently the messages have meaning; that is they refer to or are correlated according to some system with certain physical or conceptual entities." wrote Claude Shannon in Mathematical Theory of Communication. There is absolute truth in Claude Shannon's statement. Every message has a meaning. Words have to mean something. Pictures have to mean something. 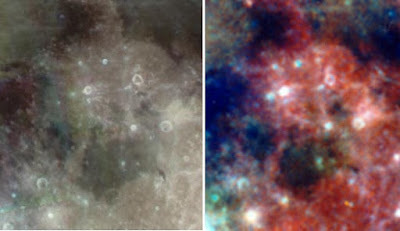 Images viewed in different wavelengths and orientation showing different features, which otherwise are indistinguishable, must mean something. In other words, everything has a meaning and a purpose for its existence. The important conclusion from Claude Shannon's principles of uncertainty is that "of reproducing at one point either exactly or approximately a message selected at another point". The word "approximately" is important because it signifies the first impact of a finding. It is only through a systematic evaluation and understanding that one can fully decode a message. The "approximate" nature of the form of message is indeed always the beginning of a longer message that points towards greater understanding of Life. Exactness can never be achieved. Exact truth means absolute truth. Precise, with no room for tolerance. Precisely what something means could never be understood in one's lifetime. Earth and the Moon, as they rotate around their axes around the Sun cause different view angles of the face of the Moon in the Northern and Southern hemispheres of Earth. So, what was Gautama Buddha pointing to and what is the message? The Moon is the nearest celestial object to Earth. It has its axis of rotation with respect to Earth. The relative spin of Earth and the Moon is such that the same face of the Moon always faces Earth. Various myths and beliefs exist. But, our beliefs must transcend in the truth rather than in the myths surrounding the fact. Myths drive us towards false beliefs. Blind faith is to accept without reasoning. Our perceptions must be held firmly by reasoning and understanding. In "The Heart of the Buddha's Teaching", Venerable Thich Nhat Hanh describes a Zen story about a man riding a horse. While at first, it is just a man on a horse, a person watching the horse galloping quickly shouts at the man "Where are you going? You must be in a hurry!" The man, feeling utterly confused shouts back "I don't know! Ask the horse!". Our life's path is like riding a horse. Venerable Thich Nhat Hanh's has said "We are riding a horse, we don't know where we are going, and we can't stop. The horse is our habit energy pulling us along, and we are powerless. We are always running, and it has become a habit. We struggle all the time, even during our sleep. We are at war within ourselves, and we can easily start a war with others." The message on the Moon appears to show this more vividly in that our journey through life is a story of being driven by desire and attachment. 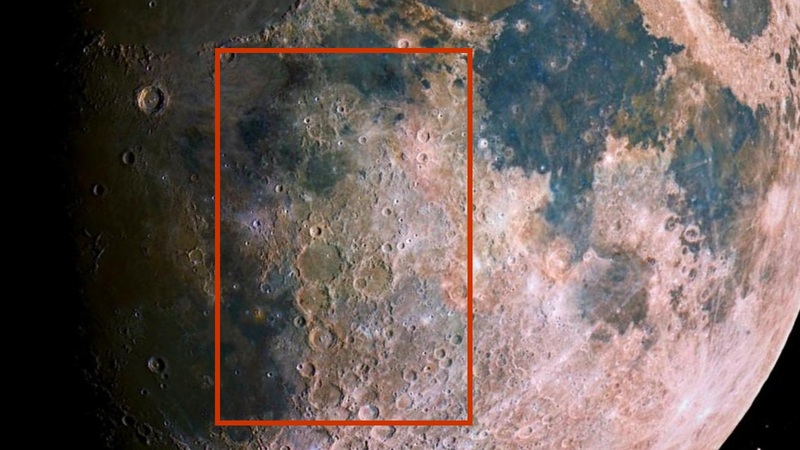 Besides the typical patterns seen on the Moon, such as the "Rabbit on the Moon", patterns never perceived before seem to emerge and shine vividly. Here is one which gives the perception of a family unit on a horse that appears to add meaning to "Samsara" a cycle of birth, death and rebirth. A spectacular sight that mystified me was the twin rays from the Crater pair, Messier A and Messier seen here in the NASA Apollo 15 Lunar mission taken from the window of the Apollo Command Module. I was intrigued by the beams of light and the power of the radiating source. 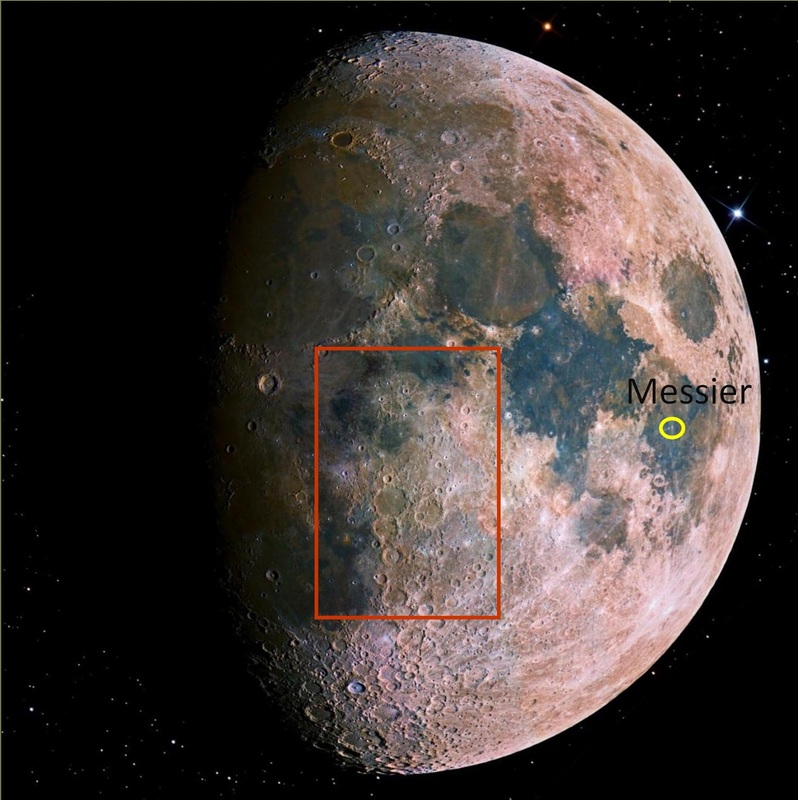 If one were planning a trip to the Moon, it could serve as a homing beacon for navigation on the Moon. It was highly intriguing, to say the least. 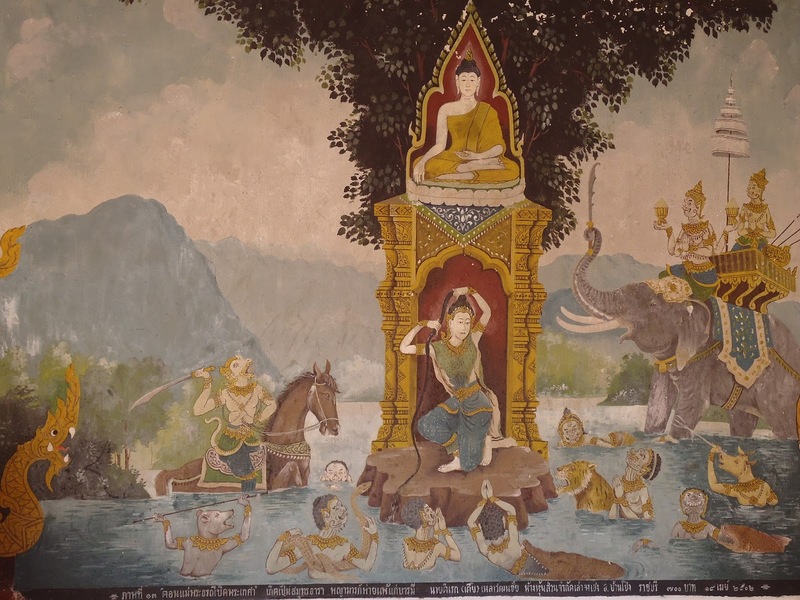 Thay Thien created several watercolor renditions of Avalokhiteshwara portrayed as a provider of all human needs throughout the cycle of human evolution. His artistic rendition covered the areas of Mare Serenitatis, Mare Tranquilitatis, and Mare Fecunditatis. These three Marias in English are, the Sea of Serenity, the Sea of Tranquility, and the Sea of Fertility, respectively, all three which aptly describe the significance of Avalokitheshwara as the Giver of Compassion and provider of knowledge and wisdom to all humankind. Serenity, tranquility and fertility describe the pure and true nature for Peace of Mind throughout the life cycle of birth and death in a state of absolute calmness. Then, like a sudden spark, a picture of the third-quarter waxing Moon baffled my imagination. The twin rays from the Messier Crater pair appeared to terminate at the center of the palm of a distinct Buddha form. The box highlights the location of a 3D holographic image that has the form referred to in Sanskrit as Abhaya Mudrā, or Fearless Form. It is a form that "represents protection, peace, benevolence and the dispelling of fear." Like a bolt from the blue, I had stumbled upon something that stunned me. Could this be what Gautama Buddha was pointing his finger at the Moon? Could this be a message for the beginning of deeper understanding of the Bhava Chakra? Images in the visible and invisible region of electromagnetic spectrum appear to show a hideous mask over a human face symbolizing the grip of Mara over the Mind of Gautama Buddha depicted in paintings. I cannot imagine how many times each day I say to myself to tame the elephant in my mind. It is a bursting feeling in the mind with no possible end in sight, and with no outlet for relief. It is anger, unrest and frustration combined in disproportionate and unthinkable ways that makes one feel as though the World around is fading away. It gives a jittery and uneasy feeling of being lost and totally confused with no way to take control of oneself. Like an elephant in rage, which can trample anything and everything in sight, you feel like jumping out screaming and destroying everything around. It is a sense of being out of control, a sense of madness, and a feeling of utter chaos. How can one possibly calm down? What is the prescription to remain calm and collected? Is there a way to find comfort and relief? There is a temptation to ask someone, a close relative or friend perhaps, it does not matter who, to show the way. "Show me the way" is exactly what the Mind is telling itself constantly. It is a never-ending persistent ringing inside the mind that does not seem to go away. Is there an answer? Is there a Way? What is the Way? I am reminded of a Koan from the Zen classic Mumonkan or The Gateless Gate Case 19, which says "Ordinary Mind is the Way". As easy as it sounds, controlling one's own mind appears to be the the commonsensical and easiest way. No one else can give that power. It is a self-generated power to resist negative change. The feeling is between giving-up, or fighting to win. It also gives meaning to controlling aggression and building a sense of self-control. There is a sense of stability which offers solace and peace of mind. A calm mind creates an environment for rational, constructive, pristine and innovative thoughts. Creative ideas help one to rationalize, organize and give meaning to why, what and how to challenge nagging issues or problems that plague the mind. Then, when one is composed and free of ill-conceived and destructive thoughts, one can direct the Mind to the knowledge of destroying the unhealthy and cankerous mind. It is a self-directed mind game in which the good and evil mind are severely at odds, disagreeing with each other, and with the good part eventually overwhelming and subduing the evil mind. It is a fight with the evil Mara in one's mind that has to be subdued and destroyed. No one can do a person greater good than what one's own well-directed mind can do. A willing person will find the way. I came across a video segment on Reuters News that meditation is a necessity for a calm Mind. Walking up a steep hill on a hot and humid morning in April of 2012 to visit the famous Buddha Pagoda in Chiang Mai, Thailand, I felt totally exhausted about half-way up. Climbing the steep path of stone steps with each step about knee-height , made me sweat profusely and feel out of breadth. I could go no further. I had to stop and rest. I was being tortured in my Mind. "Should I stop, sit down for a while and then walk down? ", I thought. A sign in the woods awakened me. "A willful man will have his way..." it said, both in English and in Thai. Of course, had it not been in English, I would have never know what it said. My first thought was "WOW"! Yes, these were the words of wisdom I needed. No one I knew could have said that to me at that moment and have received the same attention as this simple message from the woods surrounding the Pagoda. There was no one else next to me. I would be lying if I said I did not think that way. These were the words anyone wishes to hear or see that reinforces one's Mind to be willful, mindful to achieving one's goals in life. There was a sense of enlightenment and I needed that badly. "You can't give up", I said to myself over and over again. One part of the Mind says "Go" and the other "No-Go". I was reminded of a Manthra from the Heart Sutra. Translated In English: "Going-Going-Gone-Gone forever- Enter the divine Bodhi State". What is Going and Gone forever mean? What is the object that has gone? It is said that Bodhisathwa Avalokhiteshwara gave the Manthra as a means to perceive emptiness wherein all five sensory systems are gone, and even the Mind itself cannot be perceived. Lost is the Mind and hence the Mind is a void. Impossible for any one to perceive. In the conventional way of thinking, going out of one's Mind is called madness. However, if it is not madness that we perceive, then what is that feeling when there is no Mind to perceive the existence of the Mind! Difficult to perceive, let alone to understand and have the experience. Perhaps only those few Masters in our generation, His Holiness The Dalai Lama, Venerable Thich Ngat Hanh and one special person in my life, Venerable Thich Le Thien whom I refer to as Thay Thien, in Vietnam, can describe in their words that feeling towards greater awakening in our Mind. I suppose the Manthra could be read and understood as "Get-up, Walk-up, Walk-up faster and enter the Pagoda". This is exactly how I could have built the will and exert power in the Mind to act and pull myself up the hill. Our perceptions of inducing a push-pull feeling can be visualized as a "flux feild" that will induce currents in the human body and generate sufficient potential to energize the human Mind to getup and go. Imagine an iPhone with a RF chirp transmitter that can do that! A chirp that arou the stimulatory neurons to burst and stimulate the urge to do what must be done. Having gained back the strength in my Mind, I pushed myself uphill, a feeling of Mind over Matter, or Mind over Body, however one can describe a feeling of Self-control, and finally reached the Pagoda. Whether it was a pulling force or a pushing force that gave the strength I cannot describe. When I reached the top, I was simply awestruck! Everything flashed through my Mind. I thought "Where am I?" 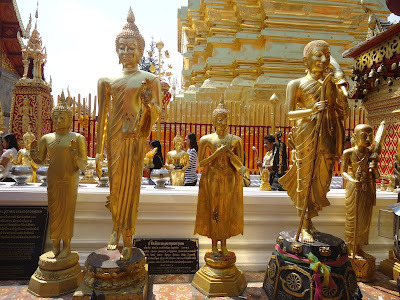 All I could see were Gold colored statues of The Buddha, Emerald Green Buddha, wall paintings from the past and a feeling of time-travelling into the past. WOW! What an enlightening feeling it was! It was as though a door had opened in my Mind. A wall-painting captivated my Mind. A human with a protective shield like none that we know now or will ever know, against an enemy that is as formidable as one can possibly imagine. Who is Mara? It must be Mara the Evil Mind. There can be no greater enemy than Mara. He is in our own Mind. "How? ", one can wonder anyone has that power in one's Mind to fight such an Evil Mind. It is said that when Gautama Buddha meditated, the elephants in the forest bowed as they passed by. The moral from this is that taming the elephant in one's Mind, will tame the elephants in the minds of others. It is said that when Bodhidharma set out to spread the wisdom of Gautama Buddha, he headed East towards what is today, China. As he approached a large open space on one Full Moon night, he saw nothing except a barren piece of land. There were no bushes, no trees, nothing. It was a place where nothing could be perceived. It looked empty because there was nothing to see, or hear. There were no animals or creatures. It appeared as if it could be the most desolate place on Earth. Suddenly, in the bright moonlit night, a perimeter guard, a warrior protecting his Emperor shouts from across the barren piece of land, : "Stop, or I will kill you". To this, Bodhidharma replies: "I am here to speak Buddha's Words of Wisdom. I come in peace. I can feel no pain if you kill me. Please kill me if you wish at this spot where I had to stop and could not proceed." Feeling challenged, the angry warrior proceeds to cross the barren land. His brisk walking is slowed down quickly by his feet sinking in the ground. Every step he took made him sink under the ground by a few centimeters. As he began to sink, he screamed for help. Bodhidharma held out his hands and pulled him out of quicksand. It is said that the warrior was enlightened. The philosophy behind this is for one to think things through before committing to do something that one wishes to achieve. One must have an extraordinary sense of awareness to perceive our environment. Regardless of the task that one wishes to undertake, it is good to realize that you are at the base of a small mountain and about to trek your way up to the top. When you get to the top, you find nothing is impossible. It is the persistence and perseverance to reach a desired goal that gives a sense of personal satisfaction. It is a self-experienced understanding that cannot be shared with anyone. Words of expression do not convey our internal feelings of joy and happiness, or the sadness of experiencing mental anguish, in ways that the other can fully understand and experience those feelings the same way. No one can show a clear path in life to another. One must seek this path oneself. The Koan "If you see a Buddha on the way, Kill him" suggests such a rule. It simply means do not merely accept what others suggest that you should do. Do whatever you think is best and follow your own true instincts towards your goals. This would lead to finding the Buddha in oneself. This is the awakening of oneself. It is said that Gautama Buddha while pointing his finger at the beautiful full Moon said to his five disciples that one must to see where the truth is. What could he be hinting to? - I have wondered. I suppose all the pain and suffering we experience is because of our desire to perceive and see things in our life that are pleasurable. What if one thinks that it is in fact a sense of greed to see more and more. For the cessation of all pain and suffering, the Heart Sutra is clearly a prescription for self-transformation. The Sutra epitomizes a state where nothing can be perceived. In such a state, the Mind itself does not exist. The Sutra states, "Mind is the Void, and Void is the Mind". The Manthra makes the transformation happen. The chant in one's Mind is synchronous with the thought of losing perception of one's own Mind. It does not matter in what language one chants. The original Sanskrit text "गथे गथे पारगथे पारसम्गथे बोधि स्वाहा "written in English is "Gathe Gathe Para-Gathe, Parasam-Gathe, Bodhi Svaaha". Equivalently in English it is "Going Going, Gone away, Gone Forever, Enter Divine Buddha". The resonant power embodied in this Manthra is of such a nature that it can transport one's state of Mind from its present state in to a state of emptiness. The instantaneous power produced is of such a magnitude so as to enable one to observe one's own Mind and to control it. This is indeed the principle characteristic of all autonomous systems. It is the ability for complete self-control. To overcome pain and suffering in our life, we must first understand why there is pain and suffering in the first place. The cause and its effect must be identified. We have to know what caused the pain and put an end to it. Suffering is the effect of pain. To counter the pain, it may appear easy at first to ignore the pain. But, ignoring pain leads to ignorance and more suffering. It is easy to perceive that our Mind is playing a game. It is a fierce battle of wits that must be overcome. Finding the way to enter the state of emptiness is analogous to removing oneself from a thick jungle of trees, wild bushes with prickly thorns, and where wild animals exist, and clearing a path through the jungle, chopping down thick bushes and vines that block our path. How can one achieve such power, I have wondered. We are in a constant battle with our Mind. It is a debate for whether or not we should do something. The good side of one's Mind is constantly opposing the bad side of the Mind. At times it appears as a fight between the two. It is synonymous to the predator and prey characteristics of all biological systems. One cannot allow one's own Mind to be dictated by the unconscionable Mind. 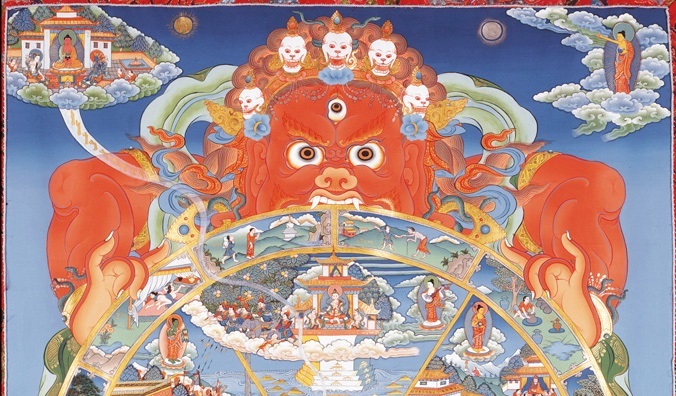 It is the evil spirit of Mara attempting to dominate the good nature of the conscious Mind. We see the pros and cons, positive and negative consequences, favorable and unfavorable outcomes, beneficial and non-beneficial results, and yet proceed to do things which go against the grain of commonsense. There is a sense of chaos where no decision seems possible. Meditation tames the mind. Meditating brings extraordinary awareness to all things happening at this very moment. It enables enhanced perception of images formed in the Mind. It brings clarity in thought. It brings out the truth in oneself. It allows one to concentrate deeply on only one thought such as emptiness, for example, if that is the only thought we wish to focus on. Meditation allows one to become deeply focused on a thought process -- a chain of interlinked thoughts. Fear is very hard to describe. It is in one's Mind. I suppose it could be described as a feeling of apprehension to do something, and that something bad will happen. It is an unpleasant feeling caused by the belief that someone or something is dangerous, and that which is likely to cause pain or even death. A dare devil who performs death defying acts is fearless knowing very well that something can go wrong. The fearlessness of the individual indicates that any amount of pain may be tolerated. So how can one overcome fear I wonder. On a recent visit to Vietnam we stayed for one night inside a floating cottage on the Mekong River. About 150 km from Saigon, we arrived at the transfer port in My Tho to be transported by boat to the cottage. It was past sunset and pitch dark. Although I could not see anything, I could somehow feel the immensity of the river. It was so dark that we had to shine a light near our feet to see where we were walking. Going up the river, I could feel the resistance of the motor boat trying to overcome the water flowing towards the boat. Other large and small boats passed by from the opposite direction. Some boats had no visual indicator such as a small light for others to see and to navigate safely. Of course these were thoughts that anyone who is foreign to the land would feel and develop a sense of fear. After just a few minutes in the boat I felt there was nothing I could do other than stare into the dark. Taking any pictures would just cause a bright flash but nothing was captured in terms of an image. I did take a couple of pictures. After that, I just sat back, listened to the roar of the diesel engine, the splashing of water caused by going upstream, and did not think about any possibility for collision. I felt safe in the hands of the boat driver, who seemed to see everything in the dark while I could not see a thing, nothing, in the pitch dark. We arrived at the floating cottage safely. There was nothing we could see beyond the dimly lit cottage property. I could feel the flow of the River and yet was not sure how to perceive the breadth of the environment. I could not wait for the first light in the morning to take a look at the immensity of the river tributary on which we were staying. Later in the morning we visited a small commune. Of course, it was a tourist spot. 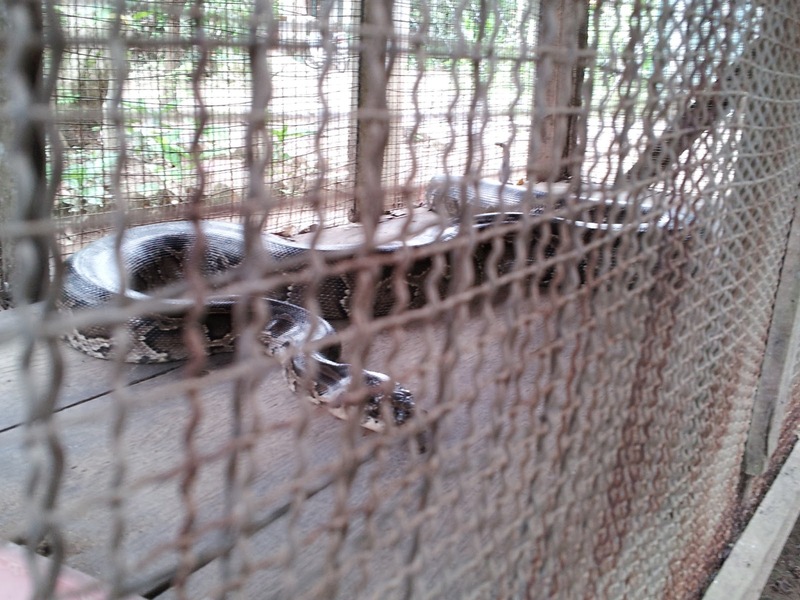 As I wandered around, I saw a cage approximately 4 meters long and a meter wide with a huge python. I asked a person standing nearby if this is found in the Mekong River region. His answer was that there were many more in the past, but now there are not as many because hunters have killed many. 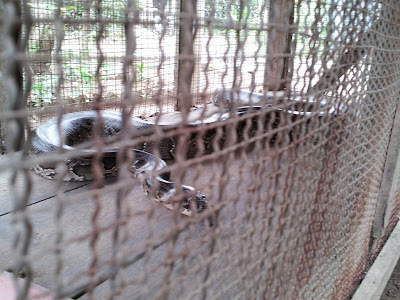 The thought that the python is an inhabitant of the Mekong River brought chills through my entire body, and a deep sense of fear in my Mind. I could not help but think how I could have slept in the floating cottage knowing that such a huge snake could be present in the waters below. When happiness returns, all the sadness that had enveloped one's Mind suddenly disappears in one split-second. The transition between sadness and happiness is a feeling that something vicious had grabbed your Mind, gripped your Mind so tightly that you felt incapacitated in rational thought, and not knowing a way out. And when its effects such as the feeling of loneliness, built-in anger about oneself, frustration, everything, disappears suddenly, sadness is completely gone. In fact, the feeling is such as that prescribed in the Heart Sutra. We must experience the feeling of something which can vanish to conclude that the transformation between sadness and happiness is by a Mantra prescribed as "Gathe, Gathe, Paramgathe, Parasamgathe, Bodhi Svaaha", "Going, Going, Gone, Gone forever, Enter the Divine Buddha". Instantly we feel transformed. It is as though we have been struck by a ray of Enlightenment in a manner causing an awakening. It is a feeling of having come out of pitch darkness into a bright opening at an instant. One can only imagine if that feeling could stay with you indefinitely. I was feeling sad yesterday, but today how can it be so different? How? -- I kept thinking repeatedly. How could it happen so quick, and what did I say, or do, which could have caused my sadness to vanish? -- These questions rang loud in my Mind. I felt a deep sense of elation, choked that I could see what I had desired so much to go back to, and feeling so happy that I was able to climb to the top of the mountain. I had no idea standing at the base of a mountain where the top of the mountain could be, and how long I should feel and experience mental anguish, and the pain and suffering caused by our natural Karma. This experience makes me conclude therefore, that the Heart Sutra is the prescription for the complete cessation of all cause and effect. If there is no cause, then there is no effect. If there no perception of any kind, there is no cause or effect. 2011 Copyright. Awesome Inc. theme. Powered by Blogger.